Ocean health is vital in conserving not only marine creatures but also the natural ecosystems they call home. The conservation team at New Heaven Dive School in Koh Tao, Thailand raises green sea turtles every summer until they are strong enough to be reintroduced into the ocean. 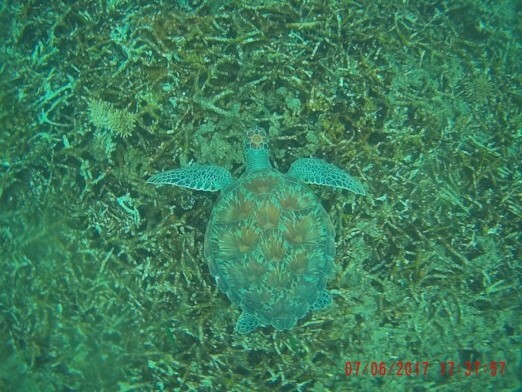 This project encourages green sea turtle reproduction and plays a huge role in repopulating the sea turtles falling population in the Gulf of Thailand. Unfortunately, during my time working with the conservation team all the baby sea turtles that arrived were very sick with bacterial infections due to the health of the ocean and died. Therefore, no turtles were reintroduced last year. In working to conserve the ocean, we would do ecological monitoring programs in which we went out to different bays off the island to survey populations of different species. In surveying species such as sea turtles, the island has seen a massive population decline, primarily due to the amount of plastic and pollutants being put into the water daily. The island use to be home to 9 different types of turtles and now is only home to green sea turtles and hawksbill. Sharks also use to be more prevalent around the island than they are now. Through surveying for fish as well as invertebrates, numbers can be recorded to evaluate species that are declining due to the health of the ocean and other predatory species. As we survey and see consistent decline, it is crucial that people worldwide are contributing to ocean conservation; if more participation is not seen, conservation efforts will be significantly less effective. A major part of my work conserving the islands ecosystems emphasized the importance of coral and how much loss of coral the planet is experiencing. Only about 0.1% of the ocean is coral and since the early 1900’s, 96% of the coral coverage in the Caribbean has been lost. The coral loss in the Indo-Pacific is at about 57%. Additionally, much of the coral is being bleached due to increasing temperatures of the currents coming into the coral reefs. This bleaching represents the zooplankton, that have a symbiotic relationship with the coral, dying. When these plankton die the coral cannot survive, and therefore is a major cause for the coral in the oceans throughout the world dying. Marine life faces many struggles in the present which greatly affects the marine ecosystem as a whole. Shark hunting has had an unimaginable impact on the balance of the food chain in our oceans. Due to the delicacy that is shark fin soup, many sharks are being terrorized by fishermen. Sharks are being illegally hunted, pulled onto ships and getting their fins cut off. After their fins are cut off they throw the still living shark back into the ocean to die. This fishing has wiped out 90% of the sharks worldwide. This has a huge impact on the oceans as without sharks the food chain cannot be balanced. Many people do not protest this abuse due to the stigma that sharks are predators of humans. During my time in Koh Tao, I swam alongside sharks and acquired a deeper respect for these creatures that are often overlooked. Working with the conservation team gave me an overall better understanding of the issues the oceans face and how to contribute to cleaning up our oceans. One major conservation method utilized is the building and implementing of artificial reefs. These artificial reefs are constructed out of various types of metal to which small pieces of coral can be attached. Once these structures are brought into the ocean, the coral attached to the structure can grow to eventually be completely covering the metal structure. In planting these artificial reefs, we are hoping that they will all thrive and expand the amount of coral to slow and ultimately reverse the rapid death of coral worldwide. Another benefit of increasing coral around the island is increasing marine life. With increased coral comes more fish, turtles, sharks and other keystone species to improve the health of the islands ocean ecosystems. Many of the issues faced both in the ocean around Thailand and around the world are due to tourism and lack of awareness. Chemicals such as sunscreens and bug repellants are damaging coral as well as the fish and invertebrates in the ocean. People walking on reefs are destroying them and without these reefs the marine ecosystem is compromised. With increased ocean tourism, there is a huge influx of chemicals polluting the ocean. This can be reduced by tourists using reef friendly sunscreens and refraining from using harsh chemicals such as deet mosquito repellents. Reef friendly sunscreens can be found online and at many stores! This is a small way you can contribute to reducing pollutants and death of marine life. With so much emphasis on plastic use lately, many people are becoming more aware of the amount of plastic they are putting back into the environment. While I was working in Thailand, I was involved in many ocean and beach cleanups in which we collected shocking amounts of plastic that made its way into these delicate ecosystems. Even items that are properly disposed of often end up in the ocean as birds raid trash cans and drop trash into the ocean and onto beaches. Due to increased amounts of microplastics in the oceans, our waters are highly unhealthy for both plant life and animal life. There is a huge increase in animals dying from ingestion and suffocation of plastics. Some tips for conserving marine life are to cut back on your use of straws - if you prefer drinking out of straws buy a pack of reusable straws that you can take with you everywhere you go! You can also cut any plastics that are circular (such as the rings that hold together six packs of sodas). By cutting these rings, you are reducing the amount of animals getting caught in these and possibly suffocating. Use reusable grocery bags to reduce the amount of plastic bags flying into the ocean and pay attention to labels on your cleaning and beauty supplies. By using brands such as Mrs. Meyers, Honest Company, Dr. Bronner’s and more, there are no harsh chemicals being flushed down your drain and into the ocean. Organic cleaning supplies can hugely reduce chemical pollution. All of these small lifestyle changes can make a huge impact on marine conservation, making our oceans more hospitable for all life!